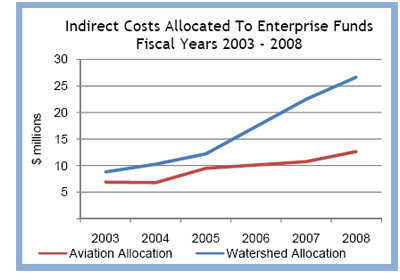 We undertook this audit because senior management from the departments of aviation and watershed management questioned whether the city’s plan for allocating indirect costs overcharged enterprise funds and expressed concern about the lack of transparency in the allocation methods. We also noted instances in which the enterprise funds seemed to be underpaying for citywide expenses, such as the $41.6 million Oracle implementation. Errors in the city’s fiscal year 2008 cost allocation plan resulted in $11 million in net overcharges to the enterprise funds.